With under three weeks to go until the pay-per-view, the lineup for the women's Money in the Bank ladder match has been finalized. Sasha Banks became the eighth person to qualify for the match, joining Ember Moon, Charlotte Flair, Alexa Bliss, Becky Lynch, Natalya, Lana, and Naomi. 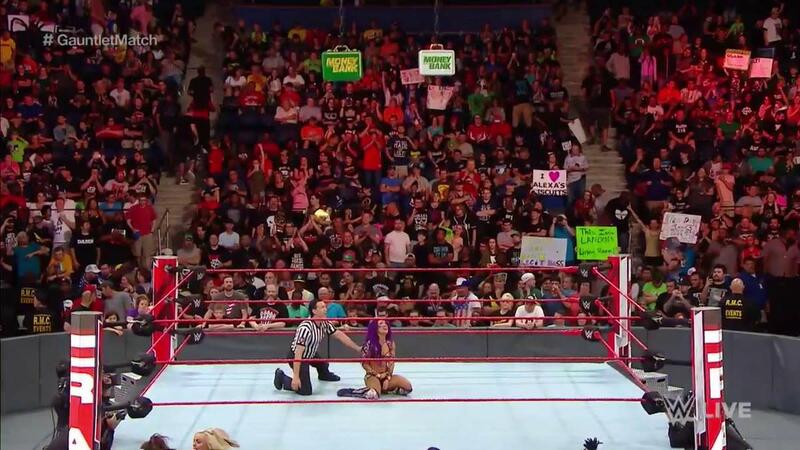 Banks came into the last chance gauntlet match on Raw tonight as the last entrant and submitted Ruby Riott to win. Bayley started the gauntlet by eliminating Liv Morgan and Sarah Logan but was attacked by them before Riott came out. Riott then defeated Bayley, Dana Brooke, and Mickie James prior to Banks entering. The final men's qualifier is scheduled for tomorrow's SmackDown, with Daniel Bryan facing Samoa Joe. Braun Strowman, Finn Balor, The Miz, Rusev, Bobby Roode, Kevin Owens, and a member of The New Day are the seven who have already qualified. Money in the Bank will take place at the Allstate Arena in Rosemont, Illinois on June 17th.